In the modern world, many of us spend most of our time in human-made environments and we tend to take many of the wonders of the natural world for granted. We don't think about it every day, but the sun provides us with light, warmth, and energy for plants to grow. Ancient cultures who were more closely in tune with nature recognized that the sun was crucial to life on earth. It is not surprising that the sun figures in myths and legends from almost every corner of the globe. In this section, we will examine the importance of the sun and sunspots in ancient cultures, the advent of the telescope, and how you can (with ordinary binoculars or a telescope) safely view the sun. stellar physicist David Dearborn, there is reason to believe that some Meso-American cultures recognized sunspots. 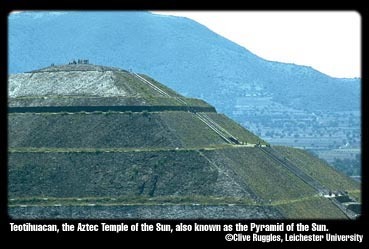 And although there is no clear evidence that the Inca or the Maya noticed sunspots, the Aztec myth of creation involves a sun god with a pock-marked face, which strongly suggests that they had seen dark blemishes on the sun. According to Dearborn, it is not surprising that most ancient cultures revered the sun as a god. "The sun is a very powerful force that affects us here on earth. It gives us warmth and light, and it has the power to grow the plants that humans use as crops. In the Andes after the Europeans first arrived, the Jesuit priests reported back to Europe, saying that people here believed the sun had the power to grow crops. Well, the sun DOES have the power to grow crops, plain and simple." The Andean peoples were not alone in their attention to the sun; in almost every early culture around the world, people revered some form of sun god. Dearborn continues, "In early stages of development, humanity looked around itself, and wanted to understand the sun, because if they could understand things, they might avoid some problems, such as planting their crops at the wrong time." But, as Dearborn explains, "their explanations in early days was usually not that the sun was just a phenomenon. Instead, they tried to understand the sun, and really all of nature, in a human context. They assigned the sun the anthropomorphic features of a god, not necessarily completely human, but a very powerful being, who should be paid attention to, and propitiated with offerings, so that it would continue to give people the heat and warmth and grow the crops." Dave Dearborn discusses the importance of the sun in ancient cultures.